1 of 3 Combine eggs and 1/3 cup of the brown sugar in a blender. Cover and pulse to combine. Add drained sweet potatoes and the reserved 3/4 cup syrup. Blend until pureed and smooth. Transfer to a saucepan. 2 of 3 Heat sweet potato mixture over medium heat, stirring frequently, for 7 minutes, or until mixture registers 160 degrees F. on an instant-read thermometer. remove from heat and transfer to a medium-size bowl and refrigerate for 45 minutes or until slightly cool. 3 of 3 Beat heavy cream with remaining 2 tablespoons brown sugar to stiff peaks. Fold half of the whipped cream into sweet potato mixture to lighten. Set aside 1/2 cup whipped cream. Fold remaining whipped cream into sweet potato mixture. Transfer mousse to 8 martini glasses. 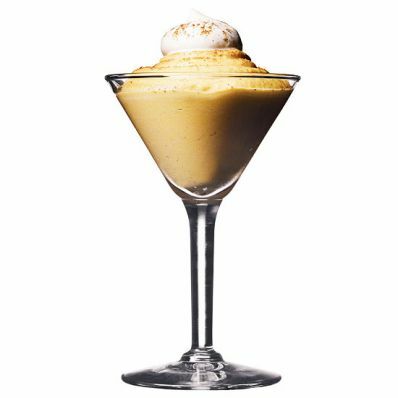 Top each with 1 tablespoon of the reserved whipped cream, dust with a little pumpkin pie spice and serve.